Salmon salad. Pretty ordinary, right? Not my version, which, as you might expect, comes with a twist: It’s not made from salmon fillets. I make my salmon salad by grilling the trim and bones after I’ve filleted the fish, then stripping the meat from the ribs for this salad. Waste not, want not. Many anglers I’ve encountered toss the heads and bones from their salmon into the sea, or use them as crab bait. This is a pity, although they do indeed make excellent bait for Dungeness crabs (and the heads are great bait for sevengill sharks). If you’re not crabbing or sharking later, it’s good to remember that there is so much meat still left on the bones of these fish — several pounds on the bones of a decent-sized king salmon. Even beyond sheer yield, however, there is a lot of truth to the saying “the closer to the bone, the sweeter the meat.” The meat you get off the racks is indeed juicier and a little fattier than that from the regular fillet. Yes, picking the meat off the bone can be fiddly. It takes me about 15 minutes to strip the good meat off the bones of a large salmon. But it’s totally worth it, especially when you think about how much wild king salmon costs in the supermarket — $30 a pound when last I checked. 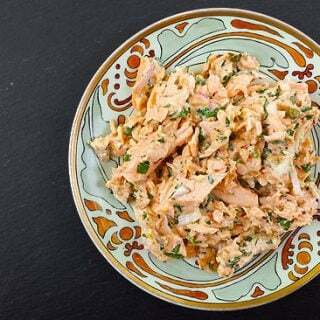 You don’t have to use the meat you strip off for salmon salad. Sometimes I use it to make salmon cakes, and it’s also good dropped into a soup. But this salmon salad is really good. It’s one of our go-to dinners when the weather is hot, and once the weather cools it makes fantastic sandwiches for lunch during the week… or for your next salmon fishing trip. My recipe is a little spicy and garlicky, but you can tone this down if you’d like. What’s important is to not waste all that meat! 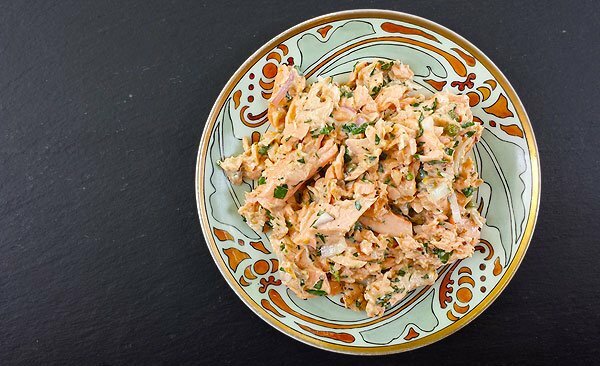 You can make this salmon salad with flaked meat from any part of the salmon, including leftovers. You can also make it from any species of salmon or trout; this is an especially good recipe for lesser fish such as chum salmon. I use king salmon, however, because that's what we catch in California. Once you make this recipe, it will keep in the fridge for 3 to 5 days. To get 1 pound of picked salmon meat, you will need the bones from 1 big king salmon of about 15 to 20 pounds, or an equivalent in smaller salmon. You can also bulk it up by adding the bellies and the collars to the mix, which is what I did with this little jack chinook in the pictures. If you are not using leftover salmon, start by grilling the bits you intend to use. Get your grill hot and make sure the grates are clean. Coat the bones and bellies in a little vegetable oil and salt them well. Once the grill is hot, grill the salmon for about 5 to 10 minutes per side. You want a little charring going on. Set the salmon on a baking sheet to cool. Once the meat is cool enough to handle, strip all the meat off the bones. One tip to remember when doing this is that the bones all point in the same direction, so you can often get big boneless pieces off in one swipe. Set the meat into a large bowl. When you are done, pick through it and check for any stray bones or globs of fat. Add all the other ingredients and mix well. Adjust salt and hot sauce to taste and serve either at room temperature or chilled. since I don’t fish, I get my salmon heads and carcasses from the fishman. This is what I believe, strongly, in — it is bad we killed for food, it is even worse if we waste ‘the living thing’ who sacrafice its life for us. 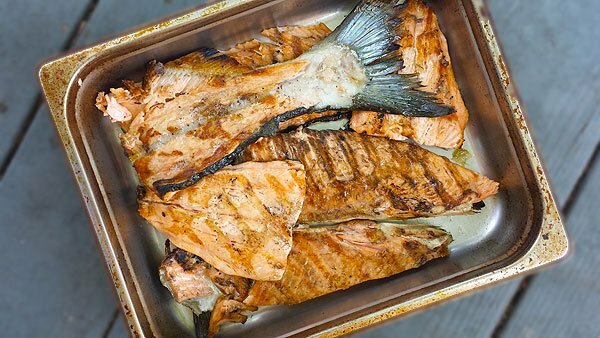 Grilling salmon for salmon salad is such an exciting and tasty idea! The extra work of stripping the meat and picking bones definitely seems worth it.